During the first-ever visit of Russian Defence Minister Sergei Shoigu to Iran, the two countries signed a pact on boosting military-technical cooperation, but experts say the prospects of Iran-Russia relations will depend on the resolution of the Iranian nuclear issue. Iran and Russia have taken an important step to boost their military cooperation by signing a pact during the official visit of Russian Defence Minister Sergei Shoigu to Tehran. The document was signed after wide-ranging talks between Shoigu and his Iranian counterpart, Brigadier General Hossein Dehghan. This was the first visit by a Russian defence minister to Iran in the last 15 years. Moscow has welcomed Iran's intention to develop a multi-faceted expansion of relations and boosting military-technical cooperation. “We believe that the priority is to focus on strengthening the legal framework,” Shoigu said. The two sides have agreed to extend the practice of warships’ entry in the ports of Russia and Iran. In addition, Moscow and Tehran agreed to hold headquarters talks, participate in the exercises as observers, train military staff and exchange the experience in peacekeeping and counter-terrorism. The Russian minister underlined the prospects of expanding counter-terror cooperation. “We welcome the spirit of Tehran's honest cooperation on Afghanistan, including in the framework of the Shanghai Cooperation Organization. I am pleased to note the serious steps taken by the Iranian side to counter drug trafficking from Afghanistan,” Shoigu said. The Iranian news agency IRNA called the two-day visit of Shoigu “an outstanding event.” “The visit of the Russian minister brings the Russian-Iranian relations to a new level of cooperation in the field of security,” said IRNA, as quoted by TASS news agency. Russian experts are divided on the prospects of the agreement. “It's premature to talk about the real significance of the agreement on military-technical cooperation,” the information projects director at the PIR Centre Andrey Baklitskiy told RIR. He stressed that there is no actual text of the document available in the public domain, and the conclusions are merely based on the words of officials. 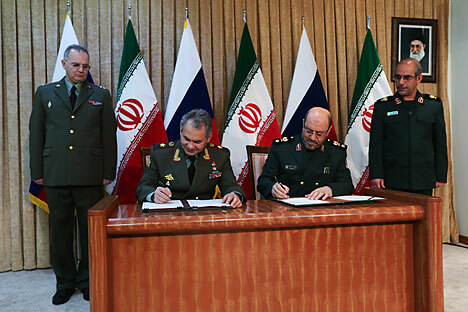 “Even upon the signing of this agreement, the process of boosting the military-technical cooperation between Russia and Iran will not be accelerated,” Baklitskiy said. According to him, the situation in the defence sector is complicated by the sanctions against Iran that prohibit other countries to supply it with high-tech weaponry. “As of now Russia can’t, for instance, make direct supplies of combat aircraft and air defence systems to Iran, although in July 2014 the Iranian ambassador in Russia Mehdi Sanai had said that Iran considers the contract to be still valid, and hopes to receive S-300 or more advanced system from Russia,” Baklitskiy said. As for simpler weaponry, Iran is entirely self-contained and provides its armed forces with such equipment itself. There may be certain prospects for Russia to supply electronic equipment, such as radars, as well as in the field of maintenance and modernisation of Iranian weapons, the expert suggests. Many types of equipment have remained in Iran since the Soviet times, such as MiG-29, Su-24 bombers, while the armoured vehicles, multi-purpose helicopters and MANPADS, supplied in the early and mid-90s, are in need of repair. Baklitskiy believes that both sides are interested in cooperation, but Russia is being highly wary so as not to disrupt the negotiations on the Iranian nuclear programme. “Therefore, no high-profile deals can be expected in the near future,” said the expert. Therefore, any significant acceleration in Iran-Russia relations will depend on the outcome of negotiations between Iran and the Western powers over Tehran’s controversial atomic programme. The successful solution of the nuclear issue will contribute to the removal of the UN Security Council sanctions and resumption of the military-technical cooperation with Iran back to the level of the early 1990s, when the two countries concluded military contracts worth billions of dollars. According to calculations by the Center for Analysis of World Arms Trade, in the case of a full-scale resumption of trade in arms and military equipment with Tehran, in the medium term the volume of Russian-Iranian military-technical cooperation could reach $11-13 billion.